Exploring the zoo is lots of fun! 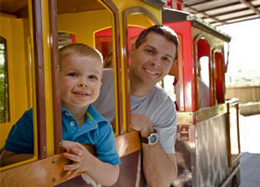 Climb aboard the miniature train, paddle across the pond, or hop on the carousel! Rides at the zoo are only available during the summer and fall seasons. The Edmonton Valley Zoo is now in our Winter Season. The Train, Carousel, and Paddle Boats are closed, and will reopen in the spring.